BMK Steel Ltd. is a family run, steel engineering business located centrally in Draperstown, Magherafelt. Established over twenty years, we have built up a reputation for excellent quality and service to our customers. We are quality assured to ISO 9001 – 2008 and CE Mark certified to Exe Class 2. Our fully equipped workshop and skilled personnel enables us to specialise in the fabrication of steelwork to the industrial, agricultural and private sectors. Supply and Erection of Structural Steelwork for Industrial and Commercial Contracts. All types of Agricultural Buildings and General Purpose Stores. Steel Beams for residential new builds and extensions. Supplying a range of cladding products. We are an authorised Air Products Agent. 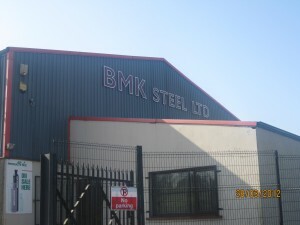 Galvanised – with quick turnaround. As an Air Products authorised agent, we are able to provide you with all of the benefits of a local supplier – backed by the expertise and knowledge of an international company. We stock an extensive range of Air Products welding and cutting gases. If you wish to set up an account for gas please contact our office for further details.